WORLDWIDE: The total annual revenue for energy storage for renewables integration (ESRI) could exceed $23 billion by 2026, according to new research. This would mark more than a 17-fold increase from the $1.3 billion in ESRI revenue in 2017. Utility-scale projects and behind-the-meter applications are expected to experience the strongest growth over this period, analysts at Navigant Research concluded in their report, Energy Storage for Renewables Integration. While ESRI revenue for wind power developers is set to rise over the next eight years, its growth and annual totals are expected to be lower than that from storage systems for solar PV facilities, the analysts predicted. Annual ESRI revenue for utility-scale wind projects is set to rise from $190 million in 2017 to $4.3 billion in 2026, according to Navigant — a 22-fold increase. But wind power developers are set to lag behind their solar counterparts, both in terms of total revenue and rate of growth. Utility-scale solar projects reaped $216 million of ESRI revenue for their owners in 2017, and by 2026 could be worth $5.3 billion annually — more than a 24-fold increase. Navigant Research did not have annual ESRI figures for behind-the-metre energy storage — the majority of which would be solar PV, the analysts said. The need for ancillary services such as storage is set to grow in order to maintain stable and efficient grid operation as renewable energy sources achieve higher penetration in the energy mix and as conventional thermal power plants are retired. Such services support the transmission of electric power from seller to purchaser to ensure interconnected transmission systems continue to operate reliably. Energy storage systems are therefore emerging as a new source of ancillary services required to maintain stable and efficient grid operation. 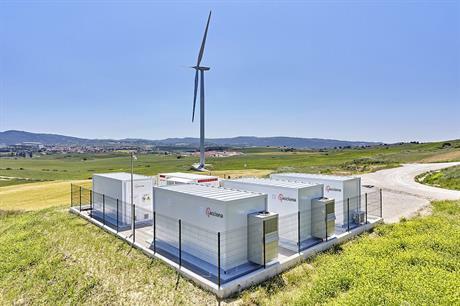 "Ancillary services have provided a critical foundation for emerging energy storage industries in several markets around the world," said Alex Eller, a research analyst at Navigant. "These services are attractive for storage developers as they often have either structured contracts or well-established competitive markets that provide a reliable source of revenue for new projects." There are barriers to developers increasing the deployment of energy storage systems, however. Regional and national variations in grid conditions, the type and amount of renewables generation, and incentives and subsidies mean developers struggle to create standardised systems and financing options deployable on a large scale, the researchers suggested. Additionally, as the costs of developing new renewable energy projects continue to drop, the need for auxiliary services to boost variability rises as traditional electrical grids are "slow to keep up with modern technology".